First stop on our honeymoon in October/November was planned to be Siam Reap in Cambodia to see the marvellous Angkor Wat temple area and by a bit of Internet surfing we were already prepared for the trip and warned about the different scams that you could encounter. Luckily we read and printed the informative warnings from Tales of Asia and how he describes that â€œALL PRIVATE BUS SERVICES TO CAMBODIA SOLD BY TRAVEL AGENTS IN BANGKOK ARE RIP-OFFS AND RIFE WITH SCAMS. ALL OF THEM. NO, NOT SOME OF THEM. ALL OF THEMâ€ (taken directly from his site) â€“ he was SO right! In the next couple of lines I will give our experiences. We stayed at the really nice hotel New Siam River Side â€“ probably the best hotel in the close to Khao San Road area, so of course we decided to ask the travel agent at the hotel for advice and maybe buying the trip to Siam Reap there. Going alone would be very difficult and to the border will be 400 bath per person. She also proposed to help with Visa to Cambodia. She could prepare it now for 1.500 bath, because its 1.300 bath at the border and very slow. - Official bus to the Cambodian Border 250 bath. - the sign at the Cambodian Border said USD 20 for the Visa, but the nice officials at the border tried to earn a little extra by charging 1.000 bath for the Visa. And the procedure was fast! We did try to get another offer at a hotel in Bangkok and the offer was close to the same â€“ 900 for the trip to some guesthouse in Siam Reap and she strongly recommended us to get the Visa now for only 1.300 bathâ€¦ but she could discount to 2.250 bath per person. And NO the USD 20 is not possible anymore â€“ now itâ€™s 1.300 â€“ A direct lie! We did of course not try the package tours, so we canâ€™t for sure tell if the trips are as slow as described in â€œTales of Asiaâ€, but on other trips we saw it. And we can only recommend planning trips by yourselves, not to save money, but to save time and irritations.. the package tours are damn slow and stop too many times, so you have the possibility to buy food ect. where the bus company get a commissionâ€¦ and you end up in guesthouses or hotels where the bus company gets a commission againâ€¦ itâ€™s all about getting a lot of extra commissions and not about getting the tourists from A-B and charge a fair price for it..
Oh yeah and then there were the fake Cambodian Visa Office on the Thai side of the border. After arriving by bus (according to schedule) around 5 km from the border we took a Tuk Tuk to the border, BUT it decided to take a right turn just before the border ( I could nearly see the Cambodian Border) and 2 mins later we were at a small cafÃ© like place where a man in a dirty shirt (from food) told us that this was the Cambodian Border and that we should buy Visaâ€™s from him.. I laughed at him at told him that I couldnâ€™t see any Border here.. he tried to point to the road outside which made me laugh a lot moreâ€¦ and then he left for a moment..
At the Cambodian side we pushed away some people who wanted to do money exchange (also a scam)â€¦ and took the free bus to the bus terminal.. went outside the bus terminal and negotiated a private taxi to Siam Reap â€“ piece of cake and from what I hear so much faster than going on the Khao San Road scam bus packages. 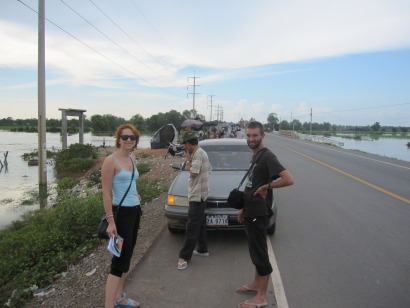 Irina and the Frenchman outside our “Taxi” – we needed a 2 mins break..
Btw the road from the Border to Siam Reap is great – not bad as it used to be. Back in good old Denmark after a great honeymoon mostly in Cambodia, but also some days in Thailand. Being a little more than 3 weeks away on a honeymoon was really great and being back in cold Denmark is both nice and a bit sad… but we bring with us so many great moments and experiences. Angkor Wat was incredible, not diving in Cambodia was sad (but it just wasnt the right season), Cambodia was really interesting and being back at Koh Chang (Thailand) was nice – and we got to dive there! Today is the day, we’re heading for our Honeymoon in Cambodia… just a bit more work, a bit of blogging and then I need to pack my backpack…. no news there..
Cambodia will mean Siam Reap, Angkor Wat (the beautiful and huge temple area – Hint: think Lara Croft), Phnom Penh (capital) and the beach by SihanoukVille – and then a little Bangkok…. Benjamin, Dan, Mole, Hartvig and Lars please remember to check up on our Apartment-sitter Julija – don’t let her have too big parties while we’re away!